Whether working solo or with a landscape architect or contractor, the budget, size of the space, color, and architectural style of your home are going to influence the choice of materials. So is availability: local stones blend in with the surrounding environment and don't cost as much as harder-to-find materials that have to be shipped. Think about what the patio will be used for and who will use it when looking at materials. Flat, smooth, even surfaces are necessary for dining areas, living rooms, and for accessibility. Rough cobblestones and bumpy aggregate concrete pavers could cause someone to trip or impede the mobility of a person who uses a cane, walker, or wheelchair. Conversely, ultra- smooth surfaces like concrete or polished granite can become slippery when wet. Apply slip-resistant coatings to high-traffic surfaces that have the potential for becoming slick. An attractive, cost-saving option is to use concrete pavers, which can be cast into a variety of sizes, shapes, and colors. Different textures and finishes can be applied to concrete, like rock salt, aggregate, faux finishes, etchings, stamping, and hand carving. Even objects as simple as brooms or rakes can create attractive textural surfaces. Both stone and concrete pavers are often spaced apart, with loose materials like pea gravel or sand or ground covers like thyme or Irish moss to fill the gaps. Take a look at our favorite 25 stunning and very different examples of patio pavers. San Francisco-based Envision Landscape Studio designed a stairway on a slope with graceful curves that create a sense of intrigue and mystery rather than a straight up-and-down path. Concrete steps are aligned with a low retaining wall to create a clean line before the steps take a curve and switch materials to ipe wood risers. The pavers are simple concrete squares, evenly spaced for a modern look and placed evenly into a bed of pea gravel. The ipe is finished with a mahogany wood stain for a rich warm hue. A Philadelphia area backyard patio is set on a grid of 2 x 3-foot full-color flagstone in a bond pattern, which keeps the installation and looks simple, according to landscape designer ​Donald Pell. "I love the simplicity of a grid in a juxtaposition of sweeping drifts of perennials," explains Pell. "I prefer simple paving details and the timelessness of using regional stone. I also always try to push patios and terraces out into the landscape so we can immerse the space in the romantic experience of a garden. The last thing I want is a patio set right up against the architecture of a house." Seattle-based landscape design/build firm Avalon Northwest excavated 6 inches, then installed and compacted a crushed rock subbase. From there, they added a sand setting bed, into which they laid the pavers and finished with concrete edging. The pavers that form the circle pattern are Old Dominion and the path is Roman Dominion from Mutual Materials. Blue star creeper edges the path and circular patio. What once was an unkempt lawn in the hills of Malibu overlooking the Pacific was transformed into a lounge and entertaining space by Gregory Davis & Associates by laying Chocolate Flagstone with pea gravel to fill in the gaps. A peaceful, exquisite patio and yard in the wine country city of Glen Ellen, California, featured select bluestone rectangles mortared over a concrete base. Heuttl Landscape Architecture designed the entire landscape, including the formed concrete water feature, low walls, and garden. Tragically, this property was destroyed in the devastating wildfires that struck the region in October of 2017. The unique shape of this San Francisco area patio was created by Shades of Green Landscape Architecture using bands of bluestone with black pebbles. Grasses, succulents, and drought-tolerant perennials were planted around the perimeter for year-round beauty in the California climate. Charcoal-hued pavers called Vancouver Bay by are tightly laid to form a clean, modern surface for a Tudor-style house in Portland, Oregon. Architect Risa Boyer designed the 2 x 4.5-foot fire pit herself, which is connected to an underground gas line. A vintage Mid-Century Modern child's chair and two butterfly chairs help modernize the outdoor space, along with a neutral grey-white-black color palette. A yard in Minneapolis is on a corner lot with limited space, creating a challenge for Southview Designs to maximize its potential. The solution: concrete pavers in walnut by Anchor, which are no longer available but similar to their current Charleston line. In addition to a garden, and dining set, there's also room for a mobile fire pit. A front yard entry garden in Seattle's Blue Ridge neighborhood features bluestone pavers with granite cobble accents laid over a concrete base. Designer Kate Martin randomly inserted 4 x 4-inch granite cobblestones with 24-inch square variegated bluestones, set over a rough slab of concrete. That bright green ground cover growing between the square concrete pavers of this patio designed by Paul Sangha Landscape Architecture is a blend of Leptinella Gruveri and mossy Saxifraga. Ipe wood decking and accent walls, a raked stone garden, a brass sheer-descent water feature, and concrete stepping pads transform an Irvine, California backyard into a peaceful space that designer Studio H dubs Zen Modern. That bright green grass growing between the Stepstone Inc. pavers is artificial turf. Closely laid brick pavers in different sizes create a smooth, even surface for a patio that doesn't compete with the rest of the landscape. The corner of a new yard in Portland, Oregon is accessible from the main patio via flagstone pavers placed across the lawn. The fire pit patio surface is also flagstone, which is available in colors ranging from white sandstone to Southwest pink/orange to black slate. The small patio of a Tucson, Arizona condo blends in with the surrounding landscape. Designed by Kathryn Prideaux, the surface is Saltillo, which is fired clay that is sealed for protection and longevity. Widely space flagstone is interspersed with smaller stones to create an intriguing effect for an outdoor living room in Montecito, California, designed by Jodi G.
Cut stone with a slightly rough texture complements the architectural style of this Southwestern patio dining room designed by Forte Homes in Phoenix, Arizona. Interlocking pavers are becoming increasingly more popular because they are non-slip, easy to remove for repairs, and permeable, which allows the release of rainfall. They are made to resemble brick, stone, and other paving materials. Stone tile, or cut stone in different sizes and colors coordinate with the custom-built barbecue and fireplace designed by B&B Pools and Spas in Eastern Michigan. 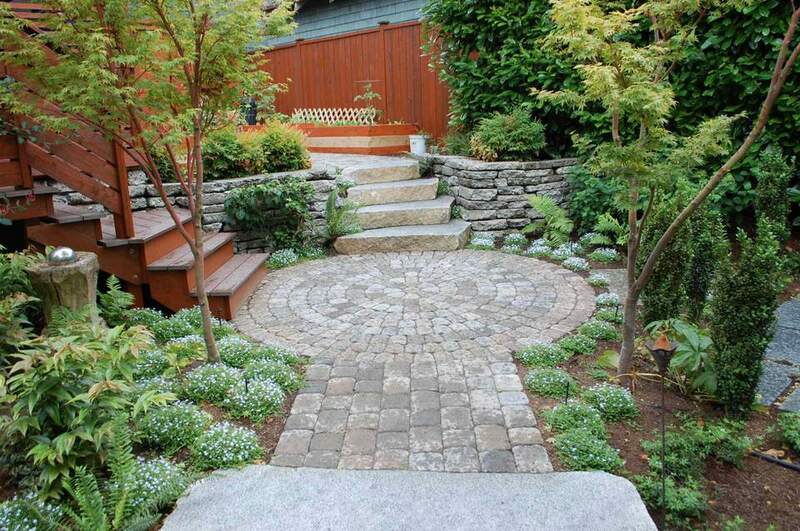 A Seattle backyard designed by Scot Eckley features an ashlar-pattern bluestone paver patio. The fireplace wall is covered with Boston ivy (Parthenocissus tricuspidata). Round aggregate pavers were popular and readily available at hardware stores and nurseries in the 1950s and have been rediscovered by fans of Mid-Century Modern architecture and design. This Venice, California patio features mixed sizes of circular pavers embedded in a sea of pea gravel. The architectural firm Coates Design oversaw the interior and exterior remodel of a modern Washington home that features square concrete pavers with a trowel skim coat finish. Coates also made the cast-in-place concrete fire pit. The filler between the pavers is colored crushed marble. For a Burr Ridge, Illinois patio, Rolling Landscapes in Chicago used patterned bluestone in a range of sizes. The patio is dry-set on compacted gravel and sand and replaced an old "builder's special" deck that was long and narrow. A circular conversation patio created by Heffernan Landscape Design is made using bluestone pavers, which are repeated throughout the landscape in paths and other areas that require hardscape. Kate Martin Design used flagstone in various colors on the patio surface, steps, and on top of the low wall, which also serves as extra seating. 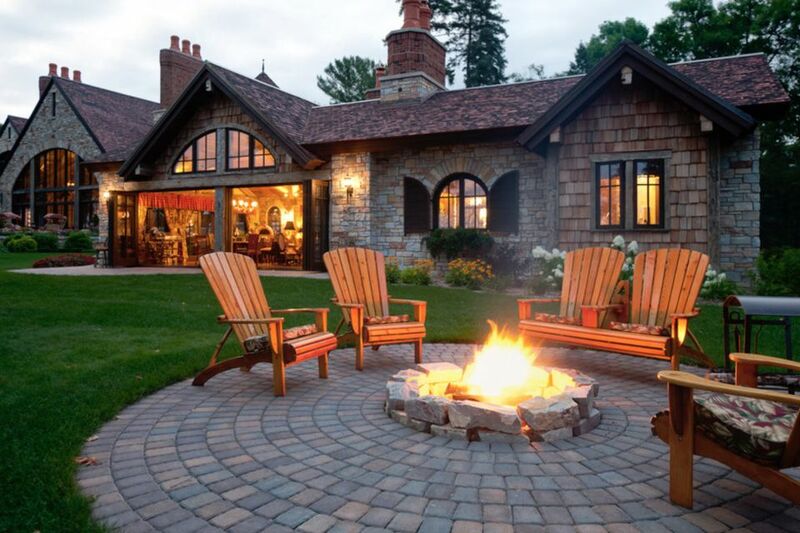 A round 3-foot fire pit fits perfectly on a circular 7-foot-diameter patio in Minneapolis. The house remodel was designed by Nor-Sun of Wayzata, Minnesota, near Minneapolis.